The Saudi-led coalition fighting in Yemen has pledged $1.5bn (£2bn) in new humanitarian aid for the country. It will also increase the capacities of Yemeni ports to receive aid and cargo shipments, and set up 17 “safe-passage corridors” for humanitarian groups. Three years of conflict and a blockade imposed by the coalition have caused what the UN calls “the worst man-made humanitarian crisis of our time”. Three quarters of Yemen’s population – 22.2 million people – need assistance. They include 8.4 million people who are considered severely food insecure and at risk of starvation – a 24% increase since April 2017. Fighting between pro-government forces, which are backed by the coalition, and the rebel Houthi movement has also left more than 9,245 dead and 52,800 injured. The UN launched its 2018 Humanitarian Response Plan for Yemen on Sunday, seeking $2.96bn to provide life-saving assistance to 13.1 million people. Later, the Saudi-led coalition announced that it would provide $1.5bn in new funding “for distribution across UN agencies and international relief organisations”. A statement said the coalition would also help expand the capacities of Yemeni ports to boost imports of aid and cargo to 1.4m tonnes annually, up from 1.1m last year. However, it did not mention ending the restrictions on access to the rebel-held port of Hudaydah, which handles 70% of Yemen’s imports. The coalition will also set up 17 “safe-passage corridors” to facilitate overland transport for humanitarian organisations, and begin daily flights of cargo planes from Saudi Arabia to the government-controlled province of Marib. “We are backing a professionally planned and detailed humanitarian mission with military power and precision to guarantee that the humanitarian aid reaches the people who need it to lift their suffering,” said spokesman Colonel Turki al-Maliki. 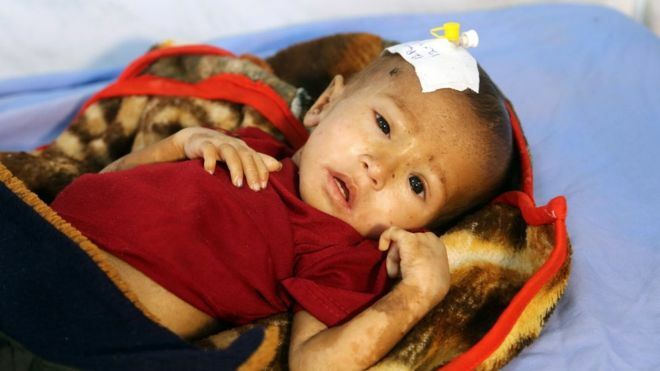 The charity Save the Children said it welcomed any measures to allow more access to humanitarian supplies and support the UN appeal, but warned that “aid can only provide a fraction of what Yemen needs to survive”. “There is a misconception that the Saudi-led coalition has lifted its blockade on Hudaydah port – but fuel is still being blocked, leading to crippling shortages across the country and unsustainable rises in the price of basic goods,” it added. Last week, Saudi Arabia deposited $2bn in Yemen’s central bank after the government appealed for help to save the country’s currency from collapse and prevent a famine. The coalition has faced widespread criticism over the number of civilian casualties resulting from its air strikes and the impact of its blockade, which was tightened in November after the Houthis fired a ballistic missile at the Saudi capital Riyadh. The US, which has provided logistical and intelligence support to the coalition and supplied it with weapons, last month called on Saudi leaders to immediately allow in all humanitarian aid.